In the spring of 1869 a young amateur naturalist was looking for a way to support himself as he explored California's Central Valley region. When a ranch owner offered him a summer job herding sheep in the Sierra Nevada mountains, the young man's wish was fulfilled. 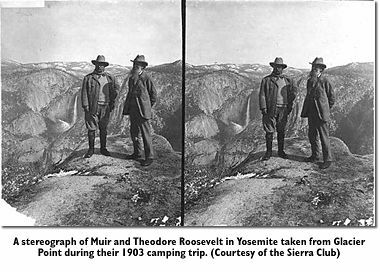 The young man's name was John Muir, and the area he visited was to become Yosemite National Park -- thanks in large part to Muir's accounts of his explorations. Muir kept a daily journal that summer, excerpts of which eventually made it into The Atlantic Monthly in 1911, shortly before the entire journal was published under the title My First Summer in the Sierra. As summer approaches and the crowds begin to head out to Yosemite, we've put together a Flashback of Muir's journals to whet the appetites of real and armchair travelers alike. These are delightful prose snapshots -- of life as a Sierra Mountain shepherd, of Yosemite's tiniest wildflowers and its "cloud-mountains full of lightning and rain" -- that overflow with Muir's infectious love for and wide-ranging knowledge of nature. After gaining the open summit of this first bench, feeling the natural exhilaration due to the slight elevation of a thousand feet or so, and the hopes excited concerning the outlook to be obtained, a magnificent section of the Merced Valley at what is called Horseshoe Bend came full in sight, -- a glorious wilderness that seemed to be calling with a thousand songful voices. Bold, down-sweeping slopes, feathered with pines and clumps of manzanita with sunny, open spaces between them, made up most of the foreground; the middle and background presented fold beyond fold of finely-modeled hills and ridges rising into mountain like masses in the distance, all covered with a shaggy growth of chaparral, mostly adenostena, planted so marvelously close and even that it looked like soft rich plush without a single tree or bare spot. As far as the eye can reach it extends, a heaving, swelling sea of green as regular and continuous as that produced by the heaths of Scotland. No two cooks quite agree on the methods of making beans do their best, and when, after petting and coaxing and nursing the savory mess, -- well oiled and mellowed with bacon boiled into the heart of it, -- the proud cook will ask, after dishing out a quart or two for trial, 'well, how do you like my beans?' as if by no possibility could they be like any other beans cooked in the same way, but must needs possess some special virtue of which he alone is master. His trousers in particular have become so adhesive with the mixed fat and resin, that pine-needles, thin flakes and fibres of bark, hair, mica-scales, and minute grains of quartz, hornblende, etc., feathers, seed, wings, moth and butterfly wings, legs and antennae of innumerable insects, or even whole insects such as the small beetles, moths, and mosquitoes, with flower-petals, pollen dust, and indeed bits of all plants, animals, and minerals of the region, adhere to them, and are safely imbedded, so that, though far from being a naturalist, he collects fragmentary specimens of everything, and becomes richer than he knows.... Man is a microcosm; at least our shepherd is, or rather his trousers. These precious overalls are never taken off, and nobody knows how old they are, though one may guess by their thickness and concentric structure. Instead of wearing thin they wear thick, and in their stratification have no small geological significance. Discuss this feature in the Community & Society forum of Post & Riposte.